Leave them in the alley or bring them back into your yard? If there is one topic that can get tongues wagging in Hamtown, it’s garbage. Or to be more specific: garbage cans. There is no shortage of examples of alleys that are littered because folks try to pack way too much garbage in their cans. The resulting overflow leaves some alleys in a state of permanent mess. But there is more to this subject than littering. It’s the garbage cans themselves. 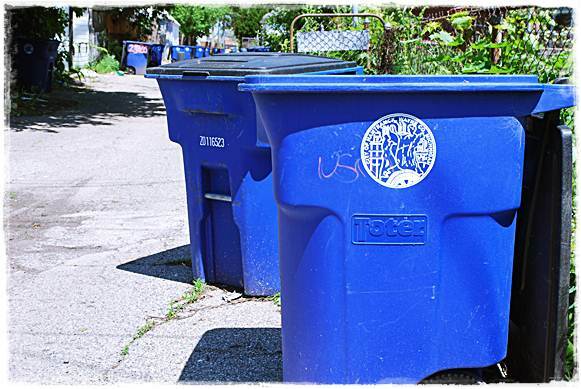 At Tuesday’s regular City Council meeting, the issue of cans came up, namely, should the city force residents to remove them from the alley after their garbage has been picked up and if so, what is the latest moment you have until getting ticketed. The subject started out innocently enough. City Manager Bill Cooper asked the council to do a relatively routine thing: set the earliest time a household can put a can out into the alley for their scheduled pickup and the latest time to remove them. And there was the rub. Councilmember Catrina Stackpoole objected to the notion of requiring households to remove cans from the alley at all. And besides, she pointed out, the cans are big and ugly. Who wants to look at a can while enjoying their backyard? Stackpoole said that as long as the cans don’t block vehicles from going through alleys, they should be able to stay put. In Hamtramck, those could be fightin’ words. City Manager Cooper said there is a problem with some households overflowing their cans with garbage and having garbage then pile up around them. Ah, but Stackpoole said that’s a separate issue. If folks can’t fit their weekly garbage into one can, they need to either start recycling or buy another can, she said. “People can be a little more conscientious about how much trash they’re putting in a landfill,” she said. Councilmember Cathie Gordon pointed out that allowing cans to stay in the alley will indeed impede traffic. She has seen several cans get ruined after being hit by delivery trucks. And so in the end, with Councilmember Stackpoole the lone voice of dissent, the council set a 9 p.m. deadline for you to remove your garbage can after pickup day. For now, it appears, the issue is settled. I HATE this. We have no place to put our bins in the backyard but in the alley, they tuck neatly next to our neighbors’ garage without any impediment to traffic (not that we have any, it’s a dead end) and they don’t stick out at all. Having to haul them out to the alley and back in isn’t fun. There is absolutely no reason to make us go back and forth with these things. It’s just stupid. Are you seriously THAT lazy? Keeping the city clean starts with you, at home. Good Lord.